Each Amazon tour with Berraco del Madidi is tailored to the interests and requirements of our guests. We have a variety of adventure activities to choose from, from guided hiking to building your own raft to boat down the river. We recommend reading about the activities that we have to offer, and then contacting us to create a personalised itinerary just for you. Although if you'd like to leave it completely in our hands we are happy to plan it for you! We require a minimum stay of 2 nights/3 days for two guests; but we recommend a longer trip to experience the whole range of activities and natural sites that we offer. 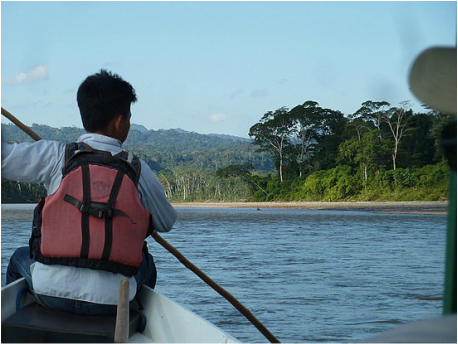 All the adventure tours start with a 6 hour scenic boat ride along the Beni & Tuichi rivers straight into the heart of the Madidi National Park. During the trip you will be able to view the Amazon wildlife on the banks of the river, such as caiman, capybaras, tropical birds and much more. The activities that we offer include guided hiking, survival skills, traditional rafting, birdwatching, traditional fishing, tours for photographers and community visits. All the activities are included in the price of the tour except the community visit which has an extra cost of $50 UDS as it is three hours upriver by boat, but it's really worthwhile if you want to get to know a completely different culture.